But really though, are you ready for Winter? Are we ever? I love vacationing somewhere warm during the winter months to escape for a little however this year as I left for Jamaica it was beautiful sunny positive weather in Toronto with no snow but then of course once I came back the negative weather kicked it, it starts to snow, ridiculous winds and extreme cold weather. Yay. My (hard) work into getting a great tan will now be hidden under the bundles of layers I must wear. Even though it is winter and freezing every year we all still try to dress up, look presentable and try to stay warm but let’s be honest, there are just those days when all you want to do is put on your biggest, warmest, coziest sweater and call it a day. On that note, I introduce to you my outfit. 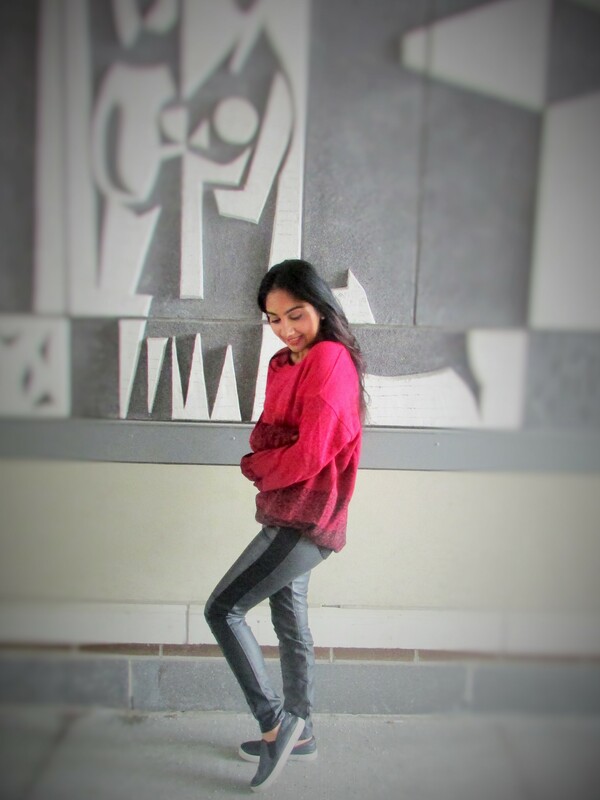 An over-sized sweater, faux leather pants and slip on sneakers. It’s almost as casual as it gets but I think the bright color in the sweater, matching red lips, faux leather, fringe purse and a few accessories pull the look together so you don’t look like you are dressed in a Snuggie. thank you so much love! 🙂 so happy that you love it! Love the leather pants! I would totally paired it with a sweater and run out of the door. So comfy and cute. They really are so great and versatile. They can help dress up any outfit and make you look a lot more put together!